Neil Young News: Archives Review of the Moment: "Music like it was all new again"
Archives Review of the Moment: "Music like it was all new again"
Comprised of 128 audio tracks, hours of video footage, and countless pieces of memorabilia all spread out over 10 Blu-Ray discs. And to think a Blu-Ray disc's storage capacity is anywhere from 25-50GB, so that's just goes to show the amount of material there actually is in this set. Not only is the content amazing, the actual audio quality of it is truly unbelievable. Over my lifetime I've probably spent days worth of time listening to Neil Young's music, but I've never heard it like this. The Blu-Ray set features "ultra-high resolution 24-bit/192 kHz stereo PCM state-of-the-art master quality sound". And to most that may sound like a load of technical gibberish (me included) but after experiencing it for almost 3 days now, I can see what all the fuss was about. I'm experiencing this music like it was all new again, I'm hearing guitar parts I've never heard before, I've listened to each of the classic 'jam' tracks like "Down by The River", "Cowgirl In The Sand", and "Southern Man" 4-5 times already. It's far beyond just listening to a Neil Young song, it's an entire thing of it's own, it's the Archives experience. A set like this is totally foreign territory for myself, as many of you know I am more or less strictly a vinyl collector, and while I do use digital formats (mp3) out of convenience, I still understand that nothing can beat the warmth of a vinyl record. So when I heard about the whole Archives project being planned for Blu-Ray format I didn't think much of it, and when I heard the price tag I thought even less of it. All I can say is that I tremendously happy with my change of heart, it has opened my eyes to what Neil is trying to do and has succeeded in doing, which is create a state of the art listening experience. All the while create a direct link to his fans through the Blu-Ray Live Updates, now throughout the years to come as more and more material gets chosen for the Archives collection it can be simply added through an Internet gateway. It really goes to show how amazing technology can be when it's utilized the right way and that one doesn't have to be content with 128kbps mp3's for the rest of their life. 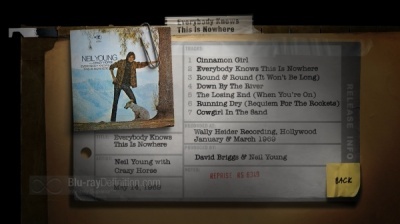 More commentary and thoughts on Neil Young Archives and our review here. Wow! What an honor it is to have an article of mine featured on the main page here at Thrashers Wheat! Thanks for that Thrasher, I really appreciate that! Great post,and good to see such an articulate expression of enthusiasm. Yes,the sound quality is incredible,it makes the music so involving,you hear the individual instrument parts so clearly,yet the whole sound is cohesive.There is a great warmth to the sound,with none of that digital harshness,brighness,coldness.Yes,it is almost like hearing the music for the first time all over again! Then you have the prospect of great additional content through downloads as well.I haven't even mentioned the excellent visual content. Given that the music includes some of Neil's finest songs and great performances from a classic era - wow!! "I'm hearing guitar parts I've never heard before." Sure this person didn't accidentally clean his/her ears before listening? We have to be resonable here. Here we have another classic example of your snark troll. You know, gobacktogo took the time to compose a nice review. And what do you to do but provide a snarky reply and wonder why your comments are deleted per the Comments Policy ? face it. You're part of the bitter and angry 4% Club. We don't run a therapy session here for you to work out your issues. Can you answer why you never post anything critical of Neil Young. You a starting (for awhile) to sound like a suit at Warners. Please answer why you do not ever even allow a comment that is negative toward Neil. This site is way to biased and it makes me think that you work for Neil or Warner. Do you have a problem comprehending the Comments Policy? What is unclear? I know you're not going to write a review and never planned too. You're incapable of a coherent thought. "Please answer why you do not ever even allow a comment that is negative toward Neil." Neil Young has a lazy eye. I agree with you wholeheartedly gobacktogo.I think I've said it before but I'll say it again.It's worth having the already released stuff on there.The sound quality is SOO great it IS like hearing em for the first time the way they were meant to be heard.Nuff said.? It is laughable "Please answer why you do not ever even allow a comment that is negative toward Neil." Such a joke. Not that anyone needs an example of us allowing negative comments, but here's a start from the archives of unhinged rantings from angry haters in The 4% Club on Neil Young News: UNCUT Album Review: Neil Young's Fork In The Road. Why can't begin to fathom why it seems to upset the 4%'ers so much when they see someone experiencing the joy of music? It's the label "4%'ers". That's whats' drivin' em wild. I can see some being 'unfufuilled' as to their expectations being met by the NYA. So what. "A little bitty tear let me down, spoiled my act as a clown"
To be a critic, one must incorporate criticism, as in Art Critic. Great gig for the happiness challenged. Neil Young is like a lava lamp, what you get is nearly what you see, always on the move... Can't, won't be tamed. "Never did it for the money, only for the show..."
I hear you SONY on that. Altho I can't really say what's driving all this ? makes no sense to me. You come here and post comments that are factually untrue (as opposed to a negative opinion) and the 4%'rs get upset when the lie is deleted. Sooner or later it all gets real. Thrash, i tried to post my objective review but it is too long to post, i got a word-count message. Here's a sample. "....Ok, here is Mr. Anonymous' much-anticipated Archives Vol. 1 review. This review is for the BluRay version operating on a PS3. Photos - STUNNING. Incredibly impressive, and great annotations. I really enjoyed seeing all the Buffalo Springfield stuff, particularly the Nurit Wilde shots - the one of Neil, shaded, is mesmerizing (Jimmy McDonough referred to it in Shakey, and he could't be more right). BTW, Ken Koblum is photogenic, and always smiling. Are there any photos of David Briggs? If not, that's a MAJOR ommission, as he was so critical as Neil's solo career launched. Also, here's an idea - as you are watching the songs via BluRay, it'd be nice if photos popped up throughout the song, maybe a note or two about the song etc. It would make "watching" much more interesting. The Book - AVERAGE. Could have been better. A lot of the articles are...."
Thrash, btw, i broke my Archives review down into 10 separate categories. how would u like me to get this to you. Good Onya for the great review! It's really what we all probably think...save for some...but WTF are they thinking? Oh well...Yes the sound is WAY beyond what anyone has heard before. If you don't know that then I suggest you are probably 1) haven't got a decent sound system, or are listening with a crappy MP3 steup or ..don't care??? Cause IF you love Neil, this whole box will bring you such great pleasure that the last thing you would do is diss the thing..Thanks to Neil and Friends. You asked for my review, i gave it to you. Any thoughts? Was it too NEGATIVE, does it make me a card-carrying 4%'er? To Mr Anonymous, Censored by NOBODY! OK, so you got your review posted. But you had to go over on rust and post The objective Archives review Thrasher didn't want you to see as "howdydoodyrocks". Guess what? When folks spread lies about us we don't like that. Your review has been deleted. Just a thought - I really like the ongoing Archives threads linked from the home news page. It's nice to be able to keep up with the conversation as people dig deeper (for me, the Archives have sent me on an extended journey back into the bootlegs, which, for the record, is just fine with Neil per "Shakey") Anyhoo - maybe you ought to consider a permanent link on the newspage to, say, call it the Asshat Squad, or whatever, where you can cut and paste all the crap. That way no one can accuse you of censorship, the Asshats can have their own little ghetto, and everyone else can live in peace and harmony.